This is just another of our favorite dinners. It taste fabulous! Plus, it's not a very time consuming, homestyle meal. I don't know the calories and things like that, I am sure I could figure that info out, I choose not to, lol, because I don't think I want to know. We do also eat healthy meals, even if I am a fan of homestyle type dinners and casseroles, I do serve well balanced meals and the children will eat healthy snacks and breakfasts. Besides, who doesn't love macaroni and cheese? 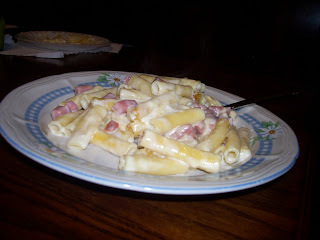 I do have a killer homemade macaroni and cheese recipe, that I should be posting with pictures soon. (I may be making that this weekend). But this macaroni and cheese is a little different, and of course, you could always change the recipe around a little to your liking. Preheat oven to 350. Butter a 13x9 baking dish. Cook and drain pasta per instructions on box. In a medium sized pot, melt butter over low heat. Add minced garlic, (or fresh garlic), stir 2-3 minutes, add milk. Stir over med high heat until the milk starts to boil, add cheese, a little at a time, stirring often. When cheese sauce becomes thick and smooth, remove from heat. Add ham and pasta in baking dish, pour cheese mixture over top. Bake for about 30 minutes, or until top starts to get brown. You could make this with any types of cheese, and even change the meat if you desire. I do make a similar dinner, with sausage and cheese. Thank you for sharing this recipe. It looks delicious. I think my husband and I would really love this one.